If you are willing to step outside of the traditional during your wedding day, you are likely looking at doing a first look between the bride and groom, and, sometimes, the bride's dad. First looks are not for everyone and I never push them on clients. Where the idea came from I have no idea , but I do know they add a special set of images to every wedding portfolio. 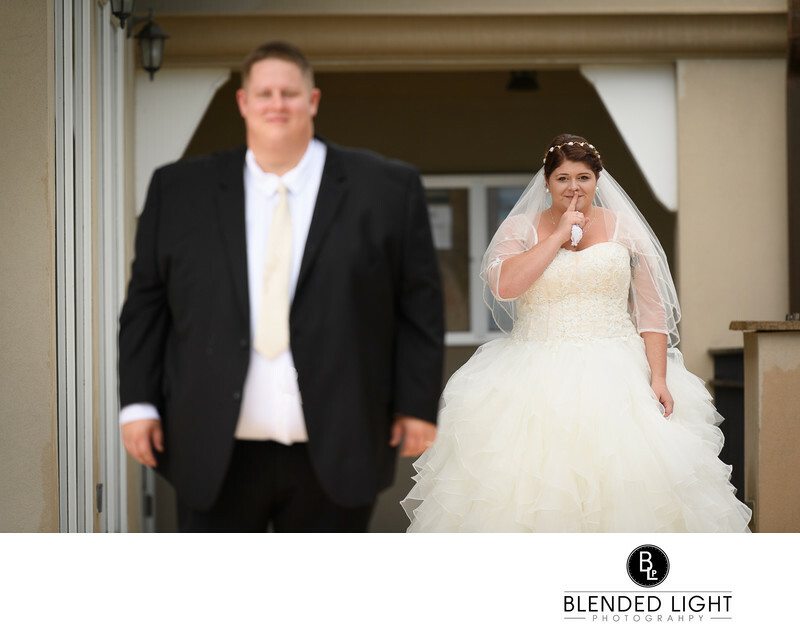 Whether to do a first look or not was never a question for this couple - they were all in for it! After getting dressed and allowing a first look for the bride's dad, I brought he groom outside on to a corner of the patio with some really soft light. Once positioned and ready, the bride sneaked out behind him. As she approached him, she paused for a second to give me the "SHHH!" sign, completely unposed or provoked. This shot represents a wonderful memory for them and was easily one of the most liked of their wedding on social media. It also serves as a great example of "staging", a technique that many photographers use to create beautiful moments that would have happened, just not in the right setting. Here, the brief pause and sign added a wonderful touch of personalization to an already excellent couple portrait on their wedding day! Location: 401 Taberna Way, New Bern, NC 28562.